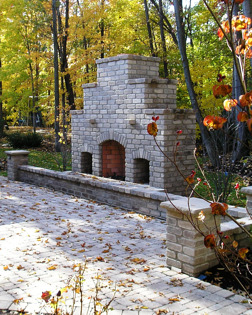 Should You Install An Outdoor Fireplace Or Fire Pit? Your home's common grounds should be a stunning and nourishing place to spend time with your family. Inspirational designs that reflect an individuals creativity can be co-created by an inspired and artistically focused designer. Have you been imagining a more impact-full and inspiring look and use for your outdoor activity areas or general landscape? Have you been craving a more stunning or impressive quality to your outdoor living space? Perhaps its time to consider outdoor fireplaces as a way to enjoy your family experiences when spending the evening hours outside. Outdoor fireplaces transform outdoor activity areas in a manner that encourages many long hours of nourishing fireside experience. Your desires can become reality when you choose professionals who have been transforming personal landscapes for homeowners for decades. Creation of the personal oasis is a matter of creativity, experience, skill and exactly the right kinds of talent. An outdoor fire-pit that is professionally designed can be like a magnet for those who enjoy the night skies and moonlit lake shore. Can you imagine relaxing in your spa while enjoying the warm glow of a fireplace, or the giggles of the children roasting marshmallows over a fire-pit that overlooks the lake? Green Impressions has been developing perfection for the vistas overlooking Lake Erie for twenty years. Our expert design teams know the nuances of weather and optimal vista engagement in combinations with space use, functionality and unexpected visual beauty. Green Impressions provides services that support the installation and ongoing maintenance of the highest-quality grounds management available today. We understand when to recommend the fireplace over the fire-pit. We have earned our reputation from paying meticulous attention to the smallest design details-- combining a respect for art and nature in a manner that provides both economic and environmental balance in order to provide the most succinct delivery of art, function, economy and breathtakingly beautiful designs installed by highly-skilled landscaping design teams. Deciding between the fire pit and fireplace can be an important decision when creating an outdoor room or lounging space. Both features will extend the pleasure of an outdoor living area by providing light, warmth and relaxation. How many friends and family will be utilizing the fire-space regularly? Outdoor fireplaces are romantic, and perfectly suited for intimate chats and long hours of conversation. Fire pits are perfect for accommodating larger groups who are engaged in lively conversations across the fire with 360 degree views available. What mood are you wanting to inspire or convey with the space? Fire pits encourage social engagement such as storytelling, marsh mellow roasts and laughter-- whereas outdoor fireplaces invoke more wistful memories and feelings. Fire pits maximize your views, and social events, while outdoor fireplaces serve as an artistic and cozy focal point for your outdoor living space. High winds can interfere with fire pit function, while outdoor fireplaces provide gorgeous, highly functional wind breaks. Smoke from wood burning fireplaces go up into the chimney, while wood burning fire pits can have smoke that gets distracting. We are experts in landscape and outdoor living space design, installation, irrigation and maintenance. If you speak with friends and family, you will discover we are considered the best in our industry. 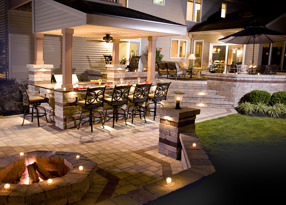 Our mission includes creation of optimal outdoor living spaces designed for connecting your home with the natural outdoor environment. Allow yourself to experience the exceptional quality available for family and friends in your outdoor sanctuary.